VietNamNet Bridge – The news that reputed public schools in Hanoi will increase their tuition fees further in the next academic year has many parents worried. Some reports say the hike in fees would take tuition fees to up to 100 times that of normal public schools in September, when the 2017-2018 begins. The latest surge in fees has come after the Ha Noi People’s Council approved a resolution late last year that empowers high-quality public schools at all levels to raise their tuition fees. 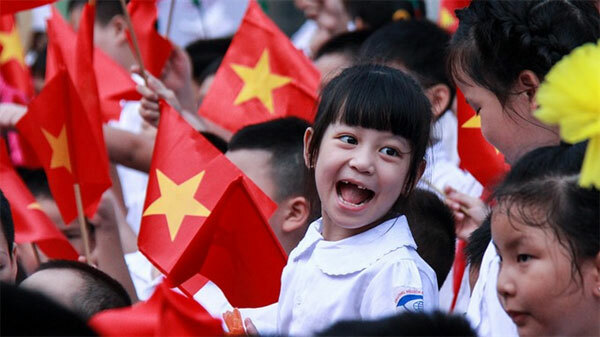 As planned, in the new school year, the maximum tuition fees will be VND4.3 million (US$190) for a student per month in high-quality kindergarten and primary schools; and VND4.5 million ($198) in high-quality secondary and high schools. In the previous academic year, 2016-17, the maximum tuition fees were VND3.9 million ($171) for a student per month in kindergarten and primary schools; and VND4.1 million ($180) per month per student in secondary and high schools, the Phu nu Viet Nam (Vietnamese Women) newspaper reported. Meanwhile, it would cost just VND55,000- 110,000 ($2.5-5) per student per month at all levels to study in a normal public school in Ha Noi for the 2017-1018 academic year. Fees for the previous year were VND 45,000-70,000 ($2-3) for a student per month. Nguyen Hoang Quan, a resident of the My Dinh Residential Area in Nam Tu Liem District, said his son was going to the 6th grade in the coming school year. He was confused and had to deliberate a bit before deciding to register his son with the Nam Tu Liem Secondary School, the high-quality public school near his house. Therefore, Quan said although he already decided to let his son learn at Nam Tu Liem Secondary School but he still worried about the quality education of the school. “I don’t know if the school’s quality matches the money I pay,” he said. Another father of two children studying in two high-quality schools in Ha Dong District said he and his wife had lived very economically to save more money for covering their children’s tuition fees this year. “The latest increase in tuition fees makes it even tougher for us,” he added. Hoang Thu Hang, of Dong Da District, a mother of a high-quality kindergarten school’s student said she was already informed that the tuition fee of his son would be raised by about VND200,000 ($9) each month for the new school year. Although she knew the school her son studied in was already quite good, she wanted further improvement in the quality of education, commensurate with the additional money being taken from parents, Hang said. Former deputy minister of Education and Training Tran Xuan Nhi said the new tuition fees were too high, especially for high schools. Nhi said the model of high-quality public schools should be designed to fit with the actual situation. “I think the income of most local residents cannot match the new tuition fees,” he said. The average income of a Hanoian is about $3,800 per year. Nhi said the local department of education and training should make its calculations with greater care so that it can improve the quality of education for reasonable tuition fees. It should let each school to decide its maximum tuition fees depending on their infrastructure and the quality of teachers instead of setting a maximum level of tuition fees for all schools, he said. Ha Noi now has 18 high-quality public schools at all levels. Under criteria of the local department of education and training, a school is defined as a high-quality one if it meets a range of standards on the quality of teachers, infrastructure and teaching methods. For example, the school is required to have at least 70 per cent of teachers with a certificate of English fluency issued by the Ministry of Educational and Training, equal to level A2 under the Common European Framework of Reference for Languages. It should have modern facilities in the classroom, labs, and kitchen as well as proper fire-fighting equipment. It should conduct more outdoor activities to improve students’ life skills and adopt teaching methods that encourage children to actively think for themselves. The department said the establishment of high-quality school was aimed to serve residents’ demand for high-quality education. It plans to construct an additional of 20 high-quality public schools by 2020 to raise education quality in the city to regional levels. The increase in tuition fees would continue in the coming years. For the 2018-2019 school year, the maximum tuition fee will be VND4.7 million ($206) for a student per month in kindergarten and primary schools and VND4.9 million ($215) per month per student in secondary and high schools. Corresponding figures for 2019-2020 would be VND5.1 million ($224) and VND5.3 million ($233).